We try where possible to buy natural and/or organic products. We believe our Suppliers are the best and are proud to work with them. Our cheese is delivered direct from Neal's Yard Dairy of Borough Market and Covent Garden. 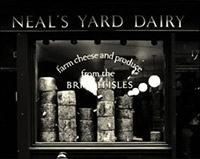 Established in 1979 Neal’s Yard specialises in mainly British cheeses, of which we have a fine selection. They also supply us with our excellent Brie de Meaux. Our coffee is supplied by the Monmouth Coffee Company, who roast beans during the week of delivery. Some consider Monmouth to be the finest coffee money can buy. We like it! We stock various types of beans and will grind them to order – our favourite is Organic Guatemalan. We exclusively use MCC espresso blend for our freshly prepared coffee to drink here or takeaway. Brindisa is an award-winning importer of high quality Spanish foods. They select, import and distribute a range of foods from the most respected producers in Spain. As well as serving the top restaurants and specialist shops in the country, they also have two of their own shops and a tapas restaurant. We are delighted to stock a range of their products. Millers Bakery is a small artisan bakery in West London. They supply us with wonderful fresh bread everyday (except Sundays). We use the best possible ingredients for our home cooked food and take deliveries of fresh greengrocery and meat everyday. 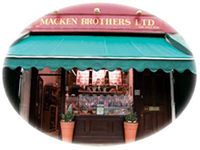 We are very proud that all our butcher meat comes from Macken Brothers Limited in Turnham Green, Chiswick. Established in 1960, they have a reputation second to none in London. Run by brothers Rodney and Jimmy Macken, locals are aware of their reputation for excellence – as the queue out of the door and up the street, stands testament on Saturday. The Fresh Olive Company was founded in 1991 and distributes a range of authentic premium quality Mediterranean Olives. It has acquired its own olive groves and has a wide selection of top quality Extra Virgin Olive oils from Spain Italy and France. Their N° 8 Balsamic Vinegar is used by all the top and Michelin starred chefs and is deliciously syrupy and the star in a broad variety of vinegars. Put all this with a selection of scrumptious antipasto products such as char-grilled artichokes and sun dried tomatoes and you have an altogether delightful choice of product. Vallebona - charcuterie, cheese and pantry products from Sardinia. Norbiton Cheeses - the finest cheeses made in the British Isles and continental Europe. Camaya Chocolates - luxury handmade chocolates produced by chocolatier Anita Neill in Staffordshire. Le Mesurier - an extensive range of chutneys, relishes, sauces and mayonnaises, Le Mesurier's offers products that stand out from the crowd. Seggiano - selected products from Italian food producers and olive oil presses. Booja- Booja - a manufacturer of extraordinarily delicious organic chocolate truffles. Fine Cheese Company - a maturer of artisan British cheeses, most of which are unpasteurised and all of which are traditionally made.